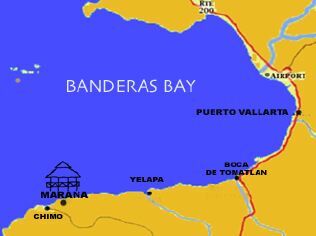 Maraña is accessed routinely by boat. Going South, from the Puerto Vallarta International Airport it takes 30 minutes by a street taxi to reach the small port of Boca de Tomatlan. 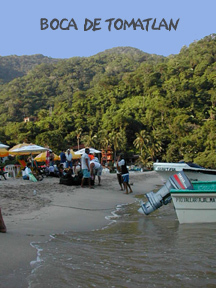 From Boca, riding along the picturesque coastline, passing by famous Yelapa and other small communities, the water taxi, 100 Pesos, (about US$10) reaches Marana in less than one hour. There is an roundabout, scenic land access to Marana. First, about 31/2 hour, 4 wheel drive, or bus ride (50 Pesos), from Puerto Vallarta to the Village of Chimo. From there, a 40 minutes coast and jungle trail hike provides a land access to Maraña.